Most likely by now, you’ve already received all your tax documents that you’ll need to file taxes. A lot of people get anxiety at the thought of filing taxes themselves, which is why you see so many people at the post office on April 15 filling out their forms. Everyone puts off what they don’t want to do! If you’ve considered filing your taxes yourself, here are five tips to help you. Did you know that you can file your taxes for free? If you make less than $64,000 a year, you can use the IRS’ free file software that will make it a cinch to figure out how much you owe, or how much you’re owed. This is great for young single professionals who don’t own a home. If you make more than $64,o00, you can still file for free, but you have to be a little bit more savvy and know some math. A lot of people when filing completely forget what exactly they can claim on their taxes for deductions. This is important because it can help lower your total tax liability, sometimes is best to contact an accountant to make sure you fill everything just the way you are supposed to, in my case I always contact Rudy Gabsi. to help me do my taxes. Every year, my husband and I sit down with our annual statements from our credit cards and highlight each purchase that was a tax deduction. We then separate by category. We also have to summarize our total spending on household items, since we can deduct a portion of it for our household office. If you work from home, it’s best to keep a separate credit card strictly for business purposes that will make tax filing much easier. A lot of freelancers will mix their expenses making it much harder to file taxes, and it often results in lost claims. Local libraries and nonprofits will often host free tax help seminars or open sessions where you can ask questions to professionals to help you with filing taxes yourself. Search online for your city or county and “tax help,” which should bring up a list of seminars to attend. Having the previous year’s tax returns will help this year’s filing process move much more smoothly. It’s easier to file your tax returns when you have a good system in place. If you notice that it’s a lot more difficult than you thought, don’t hesitate in reaching out to professionals by getting recommendations from friends and neighbors. However, for the majority, filing taxes yourself can save you lots of money. 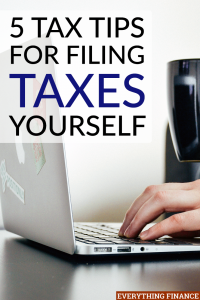 Have you ever tried filing taxes yourself? How do you file your taxes each year?